I’m old enough to remember left wing demonstrations in the UK when ‘fascist!’ was a standard chant. On most occasions back then it was a ridiculous accusation, and as such it was rightly laughed away. But times have unfortunately changed. With authoritarian regimes in some East European countries, Trump’s election and subsequent behaviour, and far right parties gaining ground in other countries, fears of a return of something like fascism are no longer a laughing matter. When Andrew Marr interviewed David Lammy a week ago, he suggested Lammy talking about appeasement of the ERG in the same terms of Hitler or apartheid was “unacceptable”. Not ludicrous but unacceptable, and by implication something Lammy should apologise for. Quite rightly, and so refreshingly for a Labour MP in the glare of TV lights, Lammy was having none of this. He said his comments were not strong enough. When Marr protested that these were elected MPs he was talking about, Lammy reminded him that the National Socialists had elected MPs. In 1932 they were the largest party in the Reichstag. Nigel Farage is not an MP, but the BBC seem happy not just to give the launch of his new party considerable airtime, but also to do so in an uncritical manner. After the BBC had chosen the soundbite from his speech about putting the fear of god into MPs for what they had done to us, no one was given airtime to warn about how dangerous that kind of speech was, and that one MP had been murdered by the far right, another plot foiled and about many other serious threats to MPs. I think it is fair to say that the launch of the Brexit party was news and had to be covered, but to provide no kind of critical balance whatsoever was a strange decision. Discussions of incipient fascism go in the wrong direction when direct comparisons are made to fascism in the 1930s. Equally ticking off check lists of signs of fascism just beg the question of how many ticks mean we should be worried. There is no generally accepted definition of fascism. We need to be more analytical, but also to update the analysis to the circumstances of today. Much of the academic discussion of this issue takes place under the umbrella of studying populism. I think this is a little unfortunate, because the populism umbrella can be spread very wide to include any political party that challenges an existing party political structure. If you are interested in incipient fascism a better conceptualisation of populism is expressed by Jan-Werner Müller. You can tell a populist by whether they claim to represent ‘the people’, which is certainly not all the people, but instead just the ‘real people’. The real people quickly becomes those that support the populist leader. The others, especially immigrants or minority religions or races, just do not count, or worse still are ‘saboteurs’ trying to thwart the ‘will of the people’. Populists of the Müller type will be strong on nationalism, as well as threats from within and without. Intimidation and violence against opponents is never far away. Populists will talk about the elite that has been leading the country astray, and how they as leader has to constantly battle against this elite, even though they themselves are often part of that elite. I think a critical aspect of Müller’s account is that populists are prepared to overturn the institutions of pluralist democracy if they believe they are frustrating what the populist leader perceives as the will of the people. Authoritarian populist leaders deny the necessity of democratic pluralism, such as an independent judiciary or an independent media. The people, as expressed through the populist leadership, takes precedence over all other elements of pluralist democracy, and these elements must be made to bow before that will or be replaced by those who embody that will. A clear example of what Müller is talking about is Viktor Orbán’s Hungary. He has pledged to create an illiberal state like Russia or China. Perhaps as a result, European Commission President Jean-Claude Juncker at a 2015 EU summit dispensed with diplomatic protocol to greet Orbán with a "Hello, dictator." To further this aim he has gone about controlling the media and courts either directly or through placement of allies, with complete success. This together with a lethal combination of extreme nationalism, scaremongering about migrants and antagonism against Muslims and Jews keeps him popular. NGOs have been attacked, which has led to legal proceedings by the European Commission. A host of public bodies like its fiscal council, the central bank, and the national elections commission, have been abolished or their independence limited. An international university in Budapest has been forced to close down. Yet Hungary is still a democracy in the sense of having reasonably genuine elections. When occasionally the opposition does win a local election, Orbán unleashes the full might of his nationalist, enemies at the door, enemies within narrative at them. With almost total control of the media and civil institutions, he can make life very difficult for the opposition. He won his last election with ease. I would argue that this is the incipient fascism of today. It is possible that Orbán’s nationalism and control of the media and other parts of the state will allow him to maintain total control for many years. If at some point in the future a unified and effective opposition does arise, we will see if Hungary moves back to democracy or to something worse than the elected dictatorship it now is. It is also easy to see many of the traits of a Müller populist in Donald Trump. He is impatient with the constraints of the judiciary, and is more than happy to fill vacancies with barely qualified or unqualified individuals who will do what he wants. He plays up threats from within and without. He has a penchant for dictators in other countries. He endlessly criticises the ‘fake news’ that comes from an independent press, and instead favours the Republican/Trump propaganda that comes from Fox News. When asked whether he was concerned about death threats that followed his disgraceful attack on one of only two Muslims in Congress he basically said no. His own Republican party provides no check on his actions. But in what sense can any of this be applied to the single political project called Brexit? The ERG are a disparate group of MPs, whose common cause is to push for the most extreme form of Brexit. There is no single authoritarian leader among them. So can Müller’s concept of populism still apply to this project and some of those who push it? Let’s begin with what happened shortly after the 2016 vote. That referendum did not specify how we left or under what circumstances Article 50 should be triggered, but May decided that she uniquely understood what the referendum meant and parliament did not need to be involved. The Prime Minister wanted to start the Article 50 process without consulting parliament. The issue went to court, and when three judges decided parliament did have to approve the decision, the Daily Mail described them on its front page as enemies of the people. The Brexit press and those promoting Brexit frequently talk about the will of the people, thereby excluding the 48% who did not vote for it. Indeed Remainers are often accused of sabotaging Brexit, and being the elite that those carrying out the will of the people have to defeat. EU citizens living here are effectively ignored, and were not even allowed to vote in the referendum. When the costs of Brexit are mentioned, we will often be reminded of how the British stood alone in WWII and came through the hardship of war. This is nationalist imagery at its most potent and dangerous. At one point the Daily Telegraph managed to find common cause with the authoritarian regime in Hungary and the far right in the US by scapegoating the same wealthy Jew for his ‘plot’ to stop Brexit. To sum up, Brexit and those that push it have displayed almost every element of Müller style populism. I have not even needed to refer to links between various Brexit politicians and the German AfD, Steve Bannon and various far right groups. Or about law breaking in order to win the vote, and the lack of enthusiasm shown by the police in investigating this. Brexit displays the same populist characteristics that you see in Victor Orban or Donald Trump. Add the violence that Brexit has inspired and the pro-Brexit right encourage with their talk of treason and we have every reason to warn about incipient fascism, as Michael Heseltine pointed out. It is also naive to imagine that all this will stop if we end up leaving the EU. Steve Bannon is creating a network of far right parties that will use immigration and islamophobia to undermine existing parties and then pluralist democracy. Islamophobia has already been employed by the Conservatives in trying to stop Sadiq Khan becoming mayor of London. Brexit of the kind proposed by May will undermine living standards for working people that have hardly grown for a decade. This stagnation, coupled by unfettered and growing inequality, is the kindling that Bannon and his network hope to set alight. In my view this has become so dangerous partly because the political centre fails to see it. The Brexiters are appeased by May rather than isolated as John Major did. Those termed political moderates fret about the leader of the Labour party as much if not more than incipient fascism. I cannot quite decide whether the BBC is just blind to all this or elements within actively promote it. A lesson of history is that the far right is at its most dangerous when it is appeased by a centre that is more concerned about the threat from the left. .The hallmark of a science is not just having refutable hypotheses, but also changing its view when data shows the theory is wrong. Economics is often accused of not being a science. A good test case to see if that is true is the minimum wage. Basic economic theory suggests if you fix wages at above their level in the market, employment will fall as less workers are employed. However a number of empirical studies, the most well known of which was written by Card and Krueger in 1994, have suggested that employment shows no noticeable decline when a minimum wage is imposed or modestly increased. My reading is that the most convincing studies do show this result, but not all do, so the picture is not completely clear. This illustrates a problem for economics (and all social sciences) that outsides often fail to appreciate. Measurements and econometric studies are often not conclusive, and even in the case of austerity you can find one or two empirical studies which says something different to all the rest. As a result, it is more difficult to use data to show a hypothesis is conclusively wrong in the way the natural sciences can. My own view is that the balance of studies clearly shows a modest minimum wage has no noticeable impact on employment, but others would disagree. Academic economists appear evenly divided, and few hold a strong opinion on the issue. A similar survey of UK economists, asked about the 2016 increase in the minimum wage, was also divided but lent more towards no effect. In contrast, most German economists appear to have been opposed to the recent introduction of a minimum wage. If you were cynical you might say that all this shows is that the views of economists just reflect their political opinions, and I would indeed expect there would be a clear correlation to support that with the minimum wage. However when either theory or evidence are pretty clear, economists do not divide by political opinion. The same survey in 2012 and 2014 showed economists largely agreeing that the Obama stimulus reduced unemployment and was beneficial, even though the political right was strongly opposed to it. The reason is that economic theory and nearly all evidence shows that fiscal expansion when interest rates are stuck at their lower bound is expansionary. Equally standard microeconomic theory is just as clear that the minimum wage will reduce employment, and I suspect that had this survey been done in the early 1990s most academics would have agreed with this, whatever their political persuasion. What has changed is the evidence. This example clearly shows a good number of academics responding to empirical results that conflict with standard theory. Furthermore some economists have done what good scientists should do and produced new theories which can explain the empirical results that the minimum wage does not reduce employment. In that sense economists have been behaving as a science should. But because there are some contrary studies, that allows two things that distinguish economics from physical sciences. The first thing is a temptation to hold on to basic theory even though the balance of evidence is against it, something that is not totally absent in the physical science either (Kuhn, Lakatos etc). The second is to allow ideological influences to help decide what should be a scientific judgement. These are the senses in which economics is an inexact science. For those interested in economic methodology, and excellent place to start is here, the title of which I am abusing in this post. However it is also worth reading this for sources on the new 'empirical turn' in economics. On the impact of ideology on economics a great place to start is this thread from Beatrice Cherrier. On the introduction and history of the minimum wage in the UK, including initial political resistance to it, see here. 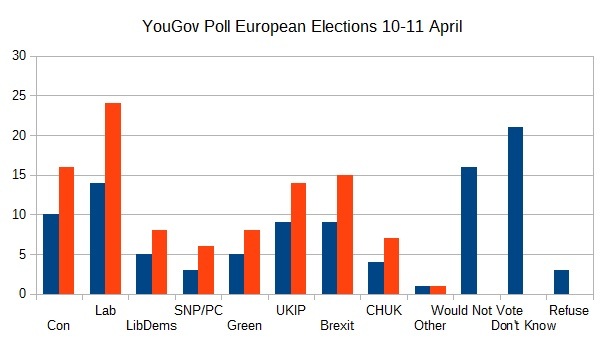 In theory the forthcoming European Elections on 23rd May should be an opportunity for Remainers to translate the clear majority for staying in the EU that we see in the polls into actual votes. Remain has been ahead of Leave since the summer of 2017, and recent majorities have been above 5%. Indeed some in the smaller anti-Brexit parties have been suggesting exactly this: the EU elections should be about Remaining rather than Leaving. Unfortunately things are not that simple, as the following YouGov poll illustrates. The smaller columns for the parties represent the data with ‘Would not vote’ and ‘Don’t know’ included. The first point is that the anti-Brexit parties are polling at around half the level of the pro-Brexit, anti-People’s Vote parties. The key problem, as it has always been for the Remain cause, is that the Labour vote is mostly made up of Remainers. In this poll, 77% of Labour voters voted Remain in the 2016 referendum, and some of the other 23% may have changed their minds since then. Labour is an overwhelmingly Remain party in terms of who votes for it, but its leadership is in favour of its own form of Brexit and appears ambivalent towards a People’s Vote. Some Remainers would love voters to desert Labour and vote for one of the three unambiguously anti-Brexit parties. But this is very unlikely to happen. Many voters, even though they might support Remain, want a Labour government above all else, and they will vote for Labour despite this being about elections to the European Parliament. This is of course exactly what happened in the 2017 general election. Voting left is hardly an irrational choice for these Remainers, because if we do not leave the EU the European Parliament does play a minor role in EU affairs and it is important to have left wing voices there. The second point is that the elections for the European Parliament is actually about voting for MEPs, so seats matter as well as the popular vote. The D'Hondt voting system used in British elections for the European parliament combined with voting for MEPs on a regional basis does penalise smaller parties. The Liberal Democrats only received 1 seat out of 73 in 2014, even though they got nearly 7% of the overall vote. As a result, if the Remain vote splits badly it is conceivable that the total seat count for the Remain parties combined may only be a few seats, which will not look good compared to the double figures that Farage will get. A very good question is why the anti-Brexit parties have not cooperated. It would be difficult to choose just one of the three parties to stand in each district, but it would not be impossible. Without this cooperation, tactical voting is unlikely to prevent the anti-Brexit vote being split three ways in each England region. It would seem these parties think it is more important to fight among themselves than unite in sending a clear message on Brexit. That will be sad if this failure leads to MEPs only being in the job for a few months. Remain can get a million on the streets and 6 million signatures, but it seems getting small parties to cooperate is a more difficult task. Another possibility would have been for the People's Vote campaign to do as Nigel Farage has done, and put up candidates themselves on a pro-EU ticket. Unlike Farage, the People's Vote campaign would face problems in doing so. Electing individuals on a simple pro-EU ticket only makes sense if these MEPs only have a very short tenure. If the campaign is successful, you want proper MEPs representing different political perspectives. That is probably one of many reasons why the People's Vote campaign will not field candidates of its own, and is perhaps another reason why the smaller parties do not cooperate. Given Labour's position and the lack of cooperation among the anti-Brexit parties, Remainers should not turn these European elections into a vote about being anti-Brexit, because they will lose badly. The combined vote for UKIP, the new Brexit party and the Conservatives is almost certain to exceed the combined vote for the LibDems, CHUK and the Greens. A smarter tactic would be, through the People’s Vote campaign, to make these elections into a vote about a People’s vote. The key difference of course is that Labour can potentially be counted as being in favour of a People’s Vote, and so making the European elections as a kind of referendum on a People’s Vote might succeed. Using the poll numbers above, the pro-People’s Vote parties have an overall majority. In reality Labour’s position on a People’s Vote is nuanced, or perhaps just confused. It is in favour of a People’s Vote for a deal it does not like, but is rather ambivalent if the deal is its own. The leadership is divided on the issue. Apparently Keir Starmer was described by Tories in the joint government/Labour negotiations as the ‘ideologue’ for wanting a People’s Vote, while his colleagues were described as more reasonable! The European elections could force Labour’s hand on the issue. This is obviously what the People’s Vote campaign will hope for, but how much the Electoral Commission will allow it to campaign over the election is unclear. If Labour did unambiguously commit to a People’s Vote in all circumstances it could take votes from the smaller parties, and this may well dominate any votes it my lose from Labour leavers. Labour has the opportunity for an overwhelming victory in these elections, as Brexit will take many votes away from the Conservatives to pro-No Deal parties. However that inducement may not be enough, in part because Labour are constantly thinking about the possibility of a General Election where they do not want to be painted as the anti-Brexit party. Remainers should also have the sense to see that a Labour victory in a general election would be a better option from a Remain point of view than a People’s Vote, for reasons I set out here. Without a general election, the Brexit position has become a stalemate. Theresa May is set against holding a People’s Vote, and so are Brexiters. Behind all their guff about such a vote being an insult against democracy (“War is peace. Freedom is slavery. Ignorance is strength”), the real reason Brexiters hate the idea of a second referendum is that they think they will lose. Nor has parliament been able to force the government to hold a referendum, with the latest vote in parliament being 280 voting in favor of a People’s Vote and 292 against. However no other option looks like getting over the line anytime soon either. Brexit has become a war of attrition. Brexiters are in no mood to accept May’s deal, and instead some have pinned their hopes on replacing her. Even if they succeed, it is unclear how this changes the parliamentary arithmetic. The Tories also fear a general election for the same reasons Brexiters fear a People’s Vote. Talks between Labour and the government are unlikely to get anywhere because a compromise that didn’t include a People’s Vote would be devastating for Labour, and any compromise by the government would pour oil on the fire of Tory divisions. Finally the new October deadline set by the EU is unlikely to force anyone to change their mind, because there is a belief in the UK that the EU will always allow another extension rather than risk an exit with no deal. In these circumstances, a People’s Vote (PV) is going to be seen more and more as the only way out. In parliament it is already the option with most votes. It is just possible that the European Elections could change some minds if it was seen as an endorsement for holding a PV. But for this to happen the PV campaign needs to persuade the smaller parties to stop talking about this election as being about Brexit and instead start talking about a People’s Vote. As far as the media is concerned, the European elections will be about the showing of the pro-No Deal parties. Indeed it could all be about Nigel Farage. His new Brexit party is well organised, well funded (from sources unknown), and is likely to get extensive publicity from the BBC at least. (To see the BBC choosing his “put the fear of god into MPs at Westminster” line as their headline quote illustrates all too well the themes of last week’s article on how the media encourages far right extremism.) The poll above, taken before his party was formally launched, indicates that his Brexit party could easily end up beating the Conservatives and coming second, as UKIP voters switch to his party. This will become the main new story. That will be painful to watch for Remainers, but ironically it could indirectly help the People’s Vote cause. Moderate Conservative MPs will see the poor showing of their party in the European elections and begin to understand more clearly the bind they are in. For as long as Brexit is an issue, they will be in danger of hemorrhaging votes to pro-No Deal parties, but if they accept No Deal the Conservatives will not be in government for decades. A People’s Vote on May’s deal may be the only chance they have of changing that situation any time soon. I have just read a paper called “Political science, punditry, and the Corbyn problem’ by Peter Allen, a Reader in comparative politics at Bath. It reflects on how most pundits, including some political scientists, got Corbyn’s initial success and then survival completely wrong. I will not attempt to summarise the paper here. It is well worth reading. I am going to take it as read that many pundits did get Corbyn completely wrong in 2015 and 2017. This has nothing to do with whether the left ascendency is a good or bad thing, but just the failure of pundits to see why it was happening. Allen notes a kind of epistemic snobbery “‘whereby people who do not meet the above criteria of political inclusion are not seen as worthy participants or contributors in political discussions, or whereby their political opinions are devalued in some way”. It was a kind of “othering” that I felt personally when I joined Labour’s Economic Advisory Council. I was told, by people who I respect, that my academic standing would be harmed if I joined the group. It was if I had decided to give economic advice to the BNP rather than the Labour party. Part of this represented a longstanding dislike by the centre and centre-left of the left in the UK that stems from the political battles within Labour in the 1980s. Andy Beckett tells some of the story here. There was a lot wrong with the Labour left at that time, and Labour leaders from Kinnock to Blair found they could gain a certain credibility by attacking both the left and the unions. Indeed some of those who attack the left today were part of the left back then, and now see the error of their ways. The Labour left came to be seen as generically toxic. Allen does not mention austerity specifically, but I think misunderstanding austerity plays a large role in failing to see how far right the Conservatives were moving, and therefore Corbyn’s rise in 2015 and Labour’s gains during the 2017 campaign. If you look at what the Coalition did collectively there can be no doubt about what was going on. The hostile environment, privatisation of the NHS, demonisation of those on welfare and so on. Yet perhaps all of these things could be explained away individually if that is what you want to do: continuing Blairs policy on the NHS, responding to popular opinion on immigration and welfare. The dominant narrative, at least to begin with, was of Cameron the moderniser. The clearest indicator of a rightward shift was austerity. It should have been clear by 2012 if not earlier that the recovery was stalling. Thatchers experiment with austerity had been brief and was quickly reversed, but Osborne was not for turning. We had for the first time since WWII a government attempting sustained austerity during a recovery phase of a recession. Perhaps too many placed their faith in City folk that told stories of imminent bond strikes, so they believed deficit reduction had to be done. But when interest rates on government debt started falling curious academic minds at least should have begun to smell a rat. Did pundits not notice that the majority of economists were against austerity? This is a genuine question rather than a rebuke, because you had to do a little research to find out they were. Understanding the deep damage that the austerity policy did to the country means that it is hardly surprising that under a left leader opposed to austerity the Labour party should attract half a million members. Too many pundits talked about this in terms that applied to the Labour party in the 1970s and early 80s, but this was a danger for rather than a description of the mass movement that Labour were becoming. As soon as Labour's position in the polls started rising in the middle of the campaign I suggested that Corbyn’s unpopularity before the campaign told us more about the media than anything else, but I’m not sure this is accepted by most pundits. Many will blame the Tories bad campaign, but what that showed us was that May and her team were pretty bad at doing politics, which was something that should have been clear given the evidence if the media had been doing its job properly. But underestimating the role of austerity is important here too. Austerity was, after a time if not initially, designed to shrink the UK state. And it succeeded. Attitude surveys tell us that is very unpopular, with less than 10% of the population wanting lower taxes and spending. So a party proposing the opposite, with a tax financed fiscal expansion that was at the heart of the Labour campaign, was bound to be popular on that account. Again the Labour surge was a consequence of a media that preferred talking about Labour divisions and personalities rather than policies, so Labour's policy stance came to voters as a surprise. Thus in my view the failure to see austerity for what it really was is crucial in understanding why pundits got Corbyn so wrong. However I would be fascinated to know how some of those same pundits themselves account for this failure, and whether they see my account having some validity or not. Treason used to be a word associated with spies or assassins. Crimes against the state of the utmost severity. Yet, to take just two recent examples, here is an article in the Sun describing how “Treacherous Theresa” has surrendered our freedom. “May's name will rank alongside those of the worst eels in Western history - and she deserves it”. Cross the Atlantic, and here is a presenter at Fox News calling for the "the traitorous treasonous group that accused Donald Trump" to be locked up. “True justice” she calls it. It seems that the word treason is now being used to describe the actions of a Prime Minister the writer disagrees with, or to describe a legal inquiry that successfully prosecuted a number of individuals who were once close to the President of the United States. How does this escalation of language happen, and does it matter? To understand both questions we need to start with what links these two examples. The are both from media outlets owned by Rupert Murdoch. As a detailed analysis of the Murdoch dynasty by Mahler and Rutenberg of the New York Times shows, Rupert Murdoch created, and runs with the help of his sons, a supremely successful media empire. Media businesses in particular are subject to regulations, and part of Murdoch’s success has been to get round those regulations. As Mahler and Rutenberg write: “Murdoch’s news empire is a monument to decades’ worth of transactional relationships with elected officials.” These are not always right wing politicians, as his support for Tony Blair showed, but they tend to be, reflecting Murdoch’s own situation and views. Murdoch is not part of a long-standing establishment but rather the opposite. In that sense he is a particularly influential example of what we could call the neoliberal elite that Aeron Davis describes so well in his book ‘Reckless opportunists: Elites at the end of the Establishment’. But why would someone like Murdoch, and the UK’s other press barons, be happy with people employed by their media organisations using inflammatory language like ‘treasonous’ in their papers? The standard response of many people in the media to a question like this is that it sells newspapers. Newspapers or radio stations or TV channels like Fox are just expressing the views of their readers. There is no doubt that is partly true, but the reality is that this is a two-way relationship. The media reflects the views of those that read or see it, but it also shapes those views. The excuse that media just reflects their audience’s opinions cannot be used to absolve those media outlets of responsibility for what is said or written there. There is now overwhelming academic evidence that the media can have a potentially powerful influence on what those who consume it think and do. A particularly interesting and powerful recent study by two economists looked at US cable channels, which remain the main source of news on political campaigns even in the digital age. They isolate viewers who view these channels just because of their place in the channel ordering, rather than because their political preferences seek out particular channels, in order to look at how influential the channel was. They find that the existence of Fox News boosted the Republican vote share in 2000 by about 0.5%, which fits with another study that used a different method to isolate the influence of Fox. However the growing viewership and increasingly right wing stance of Fox increased its impact on the Republican vote share in 2008 to a huge 6%, which was far bigger than the influence of any other channel. An equally interesting finding is that the political stance of Fox is far to the right of where it should be to maximise viewers. In other words Fox is broadcasting material that maximises its ability to shift its audience to the right, rather than to maximise its profits. Unfortunately there are no studies yet of Trump’s election, but it seems very likely that the influence of Fox was crucial in his victory over Clinton. In the primaries Fox had a more critical view of Trump, perhaps because Murdoch did not think he was up to the job. Mahler and Rutenberg found three sources who reported Murdoch saying “He’s a [expletive] idiot” about Trump, although Murdoch’s spokesman denies this. It was ironically other broadcasters that gave Trump much more coverage than his opponents, because he was “good TV”. Reporters then talked favourably about Trump, simply because he was gaining vote share. After it was clear he would win, Murdoch saw his chance to form a close relationship to a US President. That influence is now so strong that one recent article in the New Yorker was entitled “The Making of the Fox News White House” (HT @rupertww). Would this level of influence also apply to the UK press? There is every reason to think so. For example this study found that when Murdoch’s Sun switched support to Labour, it increased Labour’s vote in 1997 by 2%. That was not enough to influence the result, but when the Sun switched back to the Conservatives in 2010 that had a similar impact in the opposite direction, which was enough to influence that result. Newspapers influence attitudes towards austerity, and the best predictor of attitudes on immigration is newspaper readership. I note other studies with a similar message here. There is no doubt that both Trump and Brexit reflect deep underlying causes. What the media is able to do is help direct those causes in particular ways. To again quote Mahler and Rutenberg: “The Murdoch empire did not cause this [populist] wave. But more than any single media company, it enabled it, promoted it and profited from it.” Given the narrowness of Trump’s victory and the Brexit majority, it is extremely likely that Fox News and the Brexit press were respectively the difference between defeat and victory. Once we accept that the media can have an influence on mainstream politics, it would be very surprising if it did not also influence the political fringe. We should be shocked at soldiers using a photograph of the leader of Her Majesty’s Opposition for target practice, but we cannot just put this down to soldiers expressing their personal views about Corbyn’s attitude to Nato and his past associations. What legitimises in soldiers’ eyes doing this is the constant demonisation of him in the press. The press both reflects and influences. If you think the idea of terrorists being inspired by the mainstream media is fanciful, just listen to the extract from Fox I linked to in the first paragraph above. Of course this is an unintended effect of the extreme language the partisan media uses. Whether the rise of far right parties and groups is an unintended consequence is less clear, particularly when the BBC chooses to broadcast an interview with a far right leader straight after 49 people had been murdered in New Zealand. There is academic evidence that media coverage of far right groups like UKIP does increase support for these groups, and as I have already noted this is partly why Trump became the Republican candidate for President. But the main reason for the language the partisan media is now using is to ‘fire up the base’, who in turn will influence politicians to do what the owners of this media want. This route of influence is well established in the US, which is why David Frum, former George W Bush speechwriter, says “Republicans originally thought that Fox worked for us. And now we’re discovering we work for Fox.” We are now seeing it happen over Brexit, as candidates who oppose No Deal are deselected and would-be leaders play to a base which is heavily influenced by the partisan press it reads. There is one important difference between the UK and US, however. The US retains a widely read independent press that can discuss the influence of the media. In the UK, independent broadcasters would find that more difficult and in any case they mostly do not try. UK journalists tend not to talk about the partisan press as a key political player that can influence a party, perhaps in part because they would be talking about colleagues who work for that press. The myth that the media just reflects and does not influence is too convenient for many, so the media remains the elephant in the room in discussions about politics and political extremism in the UK. I am sick and tired of being told that the 2016 referendum gave the government a mandate to leave the EU. It did not. It did not because it did not specify a method of leaving. The Leave campaign was all over the place on how we would leave, and deliberately so. It maximised their vote. It was Cameron’s failure not to see that. He could so easily have made it a condition for holding a referendum that the Leave side put together a coherent, independently assessed and costed plan for leaving, but he didn’t. That, together with austerity, will be his legacy. I heard a good comparison the other day. Some colleagues after work decide it would be great to go out together for a meal. They all agree enthusiastically. That is decided they say. But then someone asks where they should go to eat. One says definitely not Indian. Another says they are fed up with Italian food. And so on: whatever it is someone says they definitely don’t want to go there. But they all agree they must all eat together. They end up calling the whole thing off. The lack of a specific plan agreed in the referendum would not have mattered if one of two conditions were true. The first is that everyone who voted to Leave preferred all forms of leaving to staying in the EU. That clearly is not true. The second was that the majority to leave was so large, and stayed large, such that whatever form was eventually chosen commanded a majority. In reality the majority to leave was small, and polls now show a much larger majority wanting to stay. As a result, the first referendum in itself demands a People's Vote. The logic of this is clear. Once you add in the fact that more Leavers than Remainers are changing their mind and the case for a People’s Vote is overwhelming. More people don’t laugh when Brexiters say a People’s Vote would be undemocratic because the Brexiters and the Brexit press are shouting so loud people find it hard to think. What is happening in parliament reflects these divisions within the country. It is impossible to get a majority for any form of Brexit in parliament, just as there is no majority for any form of Brexit in the country. Parliament does differ from sentiment in the country for one reason: MPs are clearly intimidated either by the referendum vote itself, the Brexit press or the Brexit majority in their constituency. This gave Theresa May an opportunity. If she had understood what the closeness of the result meant, she would see that at best there was only a mandate for the softest of Brexits. I think she could have got that through parliament, especially if she had held cross-party talks before invoking Article 50 to agree a plan. The Brexiters would have huffed and puffed, but May would have got a deal passed with Labour’s help. We all know what she actually did. One consequence of that was both sides hardened their positions. A key mistake in a long litany of errors was to believe that ‘No Deal is better than a bad deal’ was a good bargaining ploy. The EU saw it was nonsense, but it gave Brexiters hope that they could actually get No Deal. That in turn led to two heavy defeats in parliament. Thanks to the Brexit press Project Fear applies to anything negative said about leaving the EU, so many voters think having a ‘clean break’ sounds like a good idea. This hardening of positions means that the current negotiations are extremely dangerous for May and Labour. But May has nothing to lose except her legacy. Labour have everything to lose. Too many Lexiters within Labour have the attitude that Remainers have nowhere else to go. That was never true, as they could always not vote or not campaign. Alternatives have no increased with the creation of UKC and a Lib Dem party that is no longer a party of austerity. To throw away the next election for the sake of not having a People’s Vote does merit the use of the word betrayal. Betrayal not just of Remainers, but also of all those people that want or depend on Labour winning the next election. The Conservative party is increasingly looking like the Republican party in the US, with an activist and very right wing base fired up by Murdoch owned and other partisan media. The health care programme that Obama successfully introduced was very similar to something the Republican senator and presidential candidate Mitt Romney had passed in Massachusetts in 2006. Despite this the Republicans in opposition unequivocally rejected Obama’s similar reforms and fought them with all their might.